frag-ment-ed: crazy for ROBOTS: INVASION! INVASION! INVASION! Check out these cool new robots by my friend Jimmy! I just love them. So much so, in fact, that instead of picking one to post I decided to post my 4 favorites. 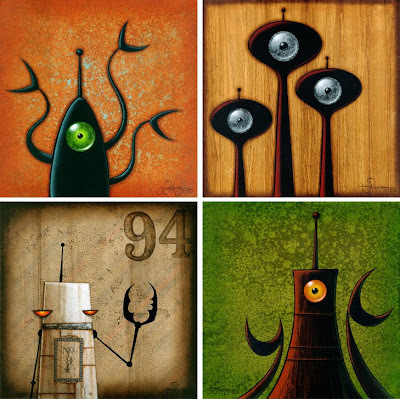 With their simple, graphic shapes and wonderfully textured backgrounds, they definitely stand out. I really love the intense, singular eyes that are on many of them - they practically jump off the painting. Very cool! INVASION! opens at DvA Gallery in Chicago on Saturday, June 19, 2008. For more information and/or to get more of a sneak peek, visit Jimmy's site. *images taken from Jimmy's site. Glad you like the pieces for the show. I did a lot more experimenting in technique than I've done in a while. The backgrounds on Skreaker and Ebuzz are something new I've learned to do with Acrylic. When you come out for the Yummy show I’ll show you, it’s really cool! I’m working away on some more new techniques for the Yummy show too . . . I think you’ll be pleasantly surprised!! !